This coming Saturday will see community events happening all day long in Newark. 10 a.m. to 3 p.m.- Newark-Arcadia Historical Society's Historic House Tour, featuring 7 unique homes, complete with vintage cars in the driveways. Tickets are only $10 per person, and available at Wegmans, Doebler Realty, Village Pharmacy, Flower Mill, Nine Pines, Sharon's Snip Shop, all in Newark and Breens in Palmyra and S.A. Gilbert Jewelers in Geneva. Tickets can also be purchased at the Newark-Arcadia Museum on High Street, where refreshments will be available. The Nick Gillette Band will kick off the Newark Chamber of Commerce Wine & Arts Walk set for 2-5 p.m. at the Port of Newark, sponsored by Wegmans and IEC. A chicken barbeque and pizza vendor will be featured in the T. Spencer Knight Park. Immediately following the concert, the Wine & Arts Walk will commence at the Chamber building, next to the East Avenue bridge. Tickets for the wine walk and tasting will be sold there at $10 and several choices of wine will be available. Included in ticket prices is a commemorative wine glass. From there move on to student art displays at Market Alternatives and Ruffalo Appliances on South Main Street. Next, visit the Newark- Arcadia Museum and check out their Empire Crafts Corp. exhibit, and across the street in the Newark Public Library you can visit the Hoffman Clock Museum. Next, visit the Wayne County Council for the Arts and view their "Floral & Fauna" exhibit. Relax at Vintage Gardens Bed & Breakfast at 310 High Street, where Wegmans Olde World Cheese Shop and Zugibe Vineyards will offer tastings and cheese pairings. Keep your wine glass, present it at the Corner Tavern, Burnham's Canalside, D's South of the Border, or Parker;s Grille, and receive a complimentary glass of wine of soda with dinner that night. We're Not Done Yet! Starting at 7 p.m., the Newark Public Library and Timothy C. Johnson Forum will present the first of a series of Environmental theme films. Playing on Saturday is Trash, a provocative investigation of one of the fastest growing industries in North America, the garbage business. Free. 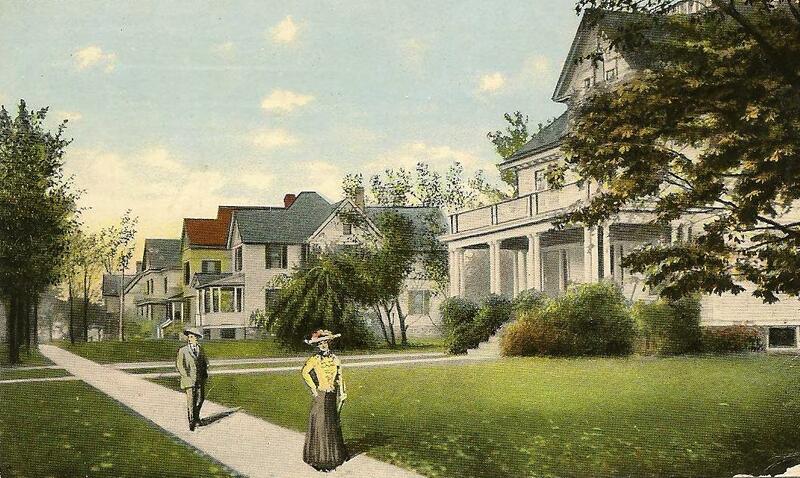 Photo- Newark's Historic East Avenue, circa 1910. 0 Comments to "NOTHING HAPPENING IN NEWARK???"